Community is very important to us at SERVPRO. We strive to be active members of the community and support those in need when we can. 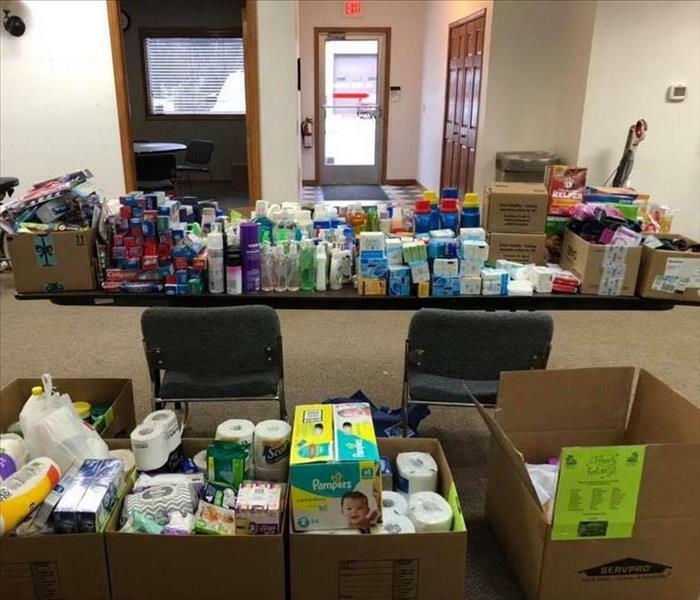 That is why we did not even think twice about supporting the Holiday Depot of Lapeer County. 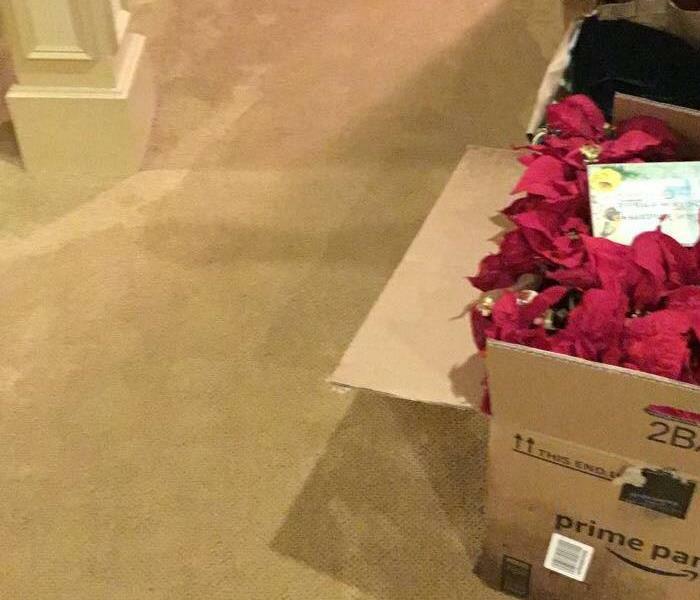 In order to show support for the organization, we became a donation center and a put gift tags on our tree for individuals looking for an item to buy. Considering we don’t get a lot of walking traffic, we decided to partner with the local elementary school to do a collection on their behalf. The school house over 400 students. We put a collection box in 19 classrooms and asked the students to bring items in over the course of 3 weeks. Any class that participated would receive candy canes and the class that brought in the most items would receive a pizza party. We were a little weary because this was the first attempt at something like this, but much to our surprise, the winning class brought in 211 items and the students, brought in 1,146 items! Those items will go a long way for this organization and the families in the community that need the assistance. Overall, this was an amazing experience and we are so humbled by the support that the students showed for those in need in our community. We can’t wait to do this again next year! The Vehicle after the training session. Have you heard of spring cleaning? At SERVPRO, we believe in fall cleaning! In this case, we had some vehicles that didn’t work and we needed to find them a new home. Instead of just shipping them off to the junk yard, we decided to donate them to the local fire association for their training session. This training session was teaching them how to remove people from the vehicles, more specifically, using the jaws of life. We were unable to attend the course due to state regulations, but from the pictures that they sent us, that class was very interesting. The two mini vans that we donated, are now doorless convertibles! We were impressed when we saw the after pictures. 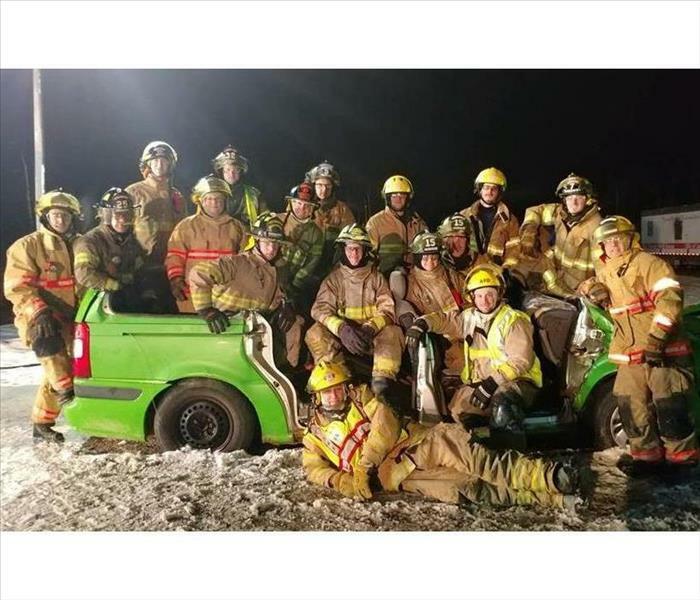 The training the members of our fire department does, it crucial to the work that they do in the field and we are happy that we were able to assist them by donating our vehicles. Volunteers working at the check-in table for the event. Part of our culture is having fun and bring people together. We also like to take advantage of opportunities when they arise. 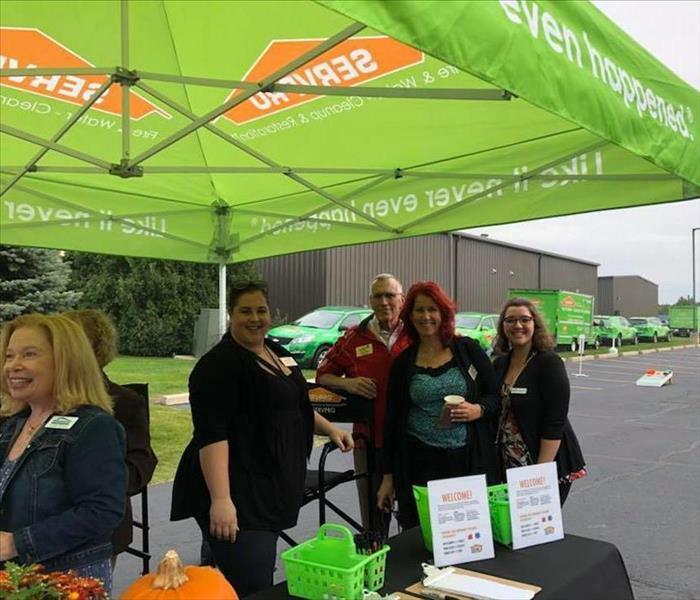 That is why we partnered with a neighboring SERVPRO to bring the community together for a SERVPRO Summer Send-off Party! This event was the largest after-hours event to date and the first tri-county event. This was a night that attendees will remember. We had it all! We had a battle of the breweries, food trucks, live music, lawn games and the option to support a local nonprofit. Guests could hang out inside the warehouse or take the party outside under the tent. While some played the lawn games, many chose to take the opportunity to network with other attendees. Periodically throughout the night, we would count the brewery votes and at the end of the night, we announced Tenacity Brewing as our winner! This event was enjoyed by all that attended, and we can’t wait to start planning for next year! Picture of attendees on class break. One of the many ways that SERVPRO helps in the community, is by providing Continuing Education Classes. These classes assist insurance agents in receiving the credits that they need for their certification throughout the year. 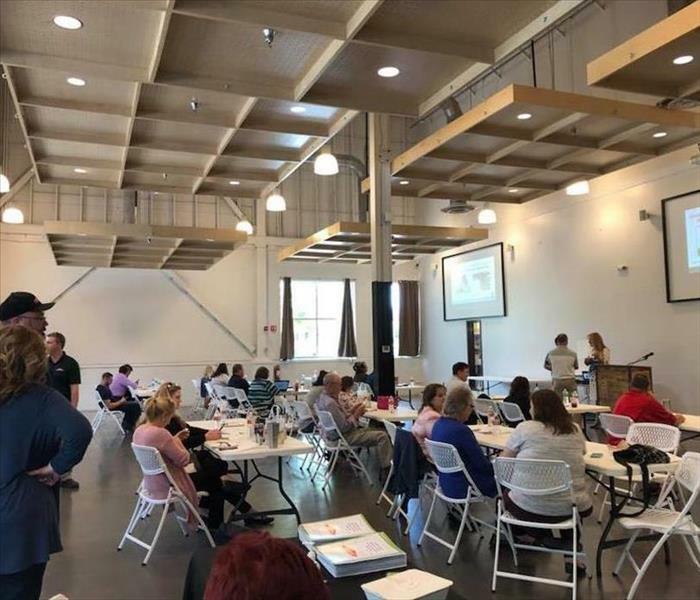 This past June, we hosted our first class at the Flint Farmers Market with approximately 30 insurance agents in attendance. Mary, from SERVPRO Corporate visited and taught them about Ethics & Fire Restoration. The afternoon session was complete with a demonstration of SERVPRO products on wood with various levels of smoke damage. We even included a question and answer section with Eric, who holds a masters in fire & water restoration and has over 20 years of industry experience. Overall, the agents enjoyed the classes and thought that they were interesting, specifically the Fire Restoration class. The carpet soaked in water from the burst pipe. In mid-August, we were called to a local home in Grand Blanc. A pipe had burst under the vanity in the bathroom. 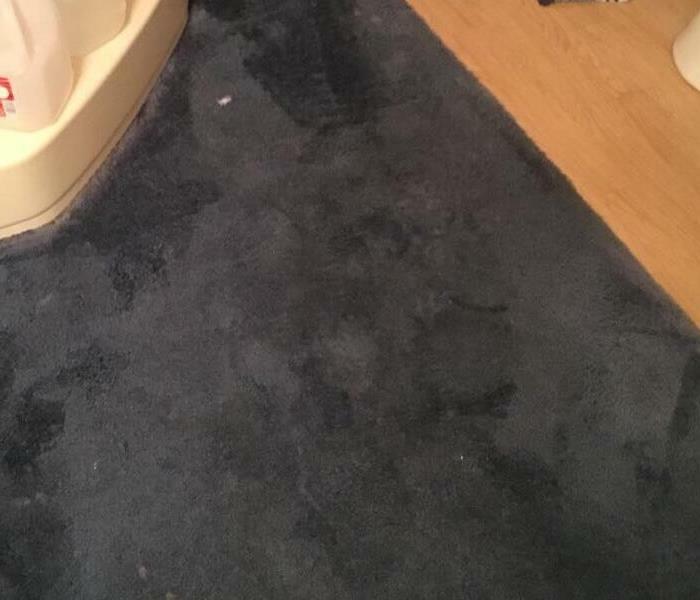 The water spread quickly from the bathroom, into the bedroom, effecting the carpet and the padding underneath. Our team quickly jumped into action assessing the damage and setting equipment. Next, our team started the required demo within the effected areas. They removed the vanity, insulation in the underbelly of the home, drilled holes in both rooms’ drywall, removed the padding under the carpet and floated the carpet. The only area of concern was the drywall behind the tub, but we were hoping that it would start to dry out and we would not have to remove it. When we returned to monitor the drying process 24 hours later, we found that the drywall behind the tub was no longer a concern and that the affected areas were drying as intended. Two days later, we returned to remove the equipment and prepare for the reconstruction process. It’s always a great day at SERVPRO and now it’s a great day this customer’s house as well! The basement that flooded as a result of the water in the crawl space. Crawl spaces are typically small and difficult to maneuver through; however, there are those times when it can’t be avoided. 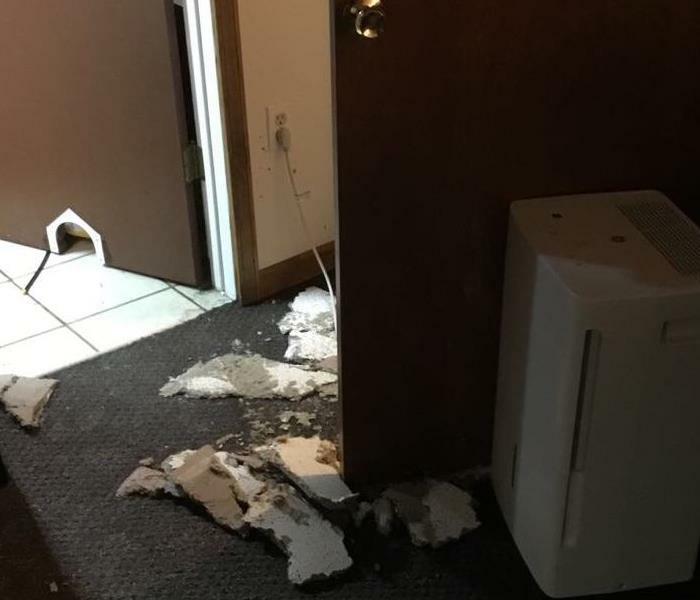 At a resident’s home in Grand Blanc, water was coming from the crawl space into the basement. The carpet was soaked, but the homeowner did not know where the water was coming from within the crawl space. A plumber came out and fixed the source, but our work was only just beginning. Our crew started by removing the carpet from the affected area. Once the carpet was removed, the equipment was ready to be set to start the drying process; however, the circuits kept popping. We learned that we were attempting to plug in more than the house could handle in that specific area. So, we regrouped and came back the next day to monitor and swap out some of the previously set equipment with some Ariel fans. This helped with the power restraint, while maintaining drying power within the affected area. After a few short days, the homeowner was able to take back their home, knowing that there was no water where it should not be! This one’s a true double header! We were called out to a home in Oxford for a shower/bath that was leaking into the basement AND mold in the basement that needed to be remediated. To start, we addressed the water issues that the customer faced, conducting demo and setting equipment to start the drying process. Next, we addressed the mold in their basement. Our crew set-up a containment zone, remediated the mold and then place 3 air scrubbers in the affected area. After a couple of days, the water affected area was dry and the affected mold area was good to go. This job is now in reconstruction and soon their home will look like the shower/bath never leaked and the mold was never even there. The basement under where the supply line had broke. Those darn sinks sure can make an unexpected mess in a home! One moment it is just sitting there and the next, there is water everywhere! What do you do? Who do you call? This customer called us and now their home is as if it never even happened! At this Flint home, the kitchen sink caused a mess! The supply line under the sink broke, cause water to go everywhere. Our crew showed up on site and immediately started extracting the standing water. From there, they started the demolition process. The kitchen floor, base boards, sub floor, insulation under the sub floor in the basement and vanities were all removed. The equipment was set and we began the next stage of water losses, monitoring. Each day a member of our crew returned to the house to ensure that it was drying properly. After a couple of days, they home was dry, and reconstruction was able to come in and put their home back to normal. A few weeks ago, we received a call from a company in need of a disinfecting clean. A physical Therapy Company recently learned that one of their patients was diagnosed with C-diff Colitis, a highly contagious bacterial infection that typically resides in the colon. Their facility was shut down directly after receiving the news. We received the call shortly after 4:00 PM and started mobilizing our staff. This was an all hands-on deck situation, as the business needed to reopen the next day. Our staff quickly packed their vehicles, grabbed the proper Personal Protection Equipment and hit the road. Upon arrival, the crew visited the neighboring store to get the key to the building. Given the nature of the job, prior to entering the building, our crew needed to put on a full Tyvek suit and full-face respirator to ensure that they could safely clean the facility. Our crew knocked that cleaning job out in just 2 hours and the company was able to reopen the next day with their mind at ease. The laundry room after the flooring was removed and the air movers were set. We have all hoped that our washing machine will never turn against us and clean nothing more than the items that we put inside it; however, sometimes that is not case. 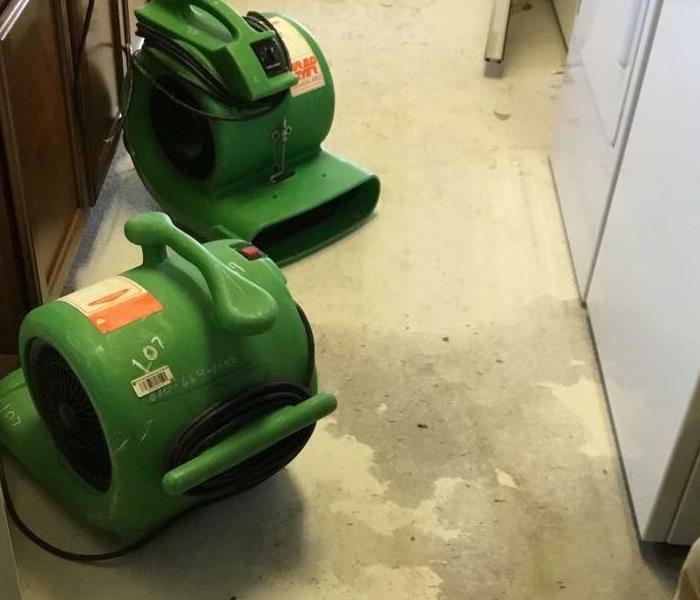 We recently completed a water loss in Grand Blanc where the hose for the washing machine broke, leading to water overflow. When we arrived on site, we learned that multiple levels were affected. Ben and Tracy and immediately started a hard surface extraction to remove the water from the flooring. It was after that process was completed that they noticed the vinyl flooring was starting to bubble and was reading 99% wet on the moisture reader. They are removed the flooring, set equipment and took the next couple days to monitor. Now the customer’s home is as if it never even happened. 8/17/2018 - Crawl Space Pool?